Western Lever Action Rifles are so popular they require their own Category, especially with our new additions. Whether you call them western lever action Rifles, Old West, Wild West or Cowboy Lever Action Rifles we have them. We have several of the ever popular Yellow Boys, we have banded lever action rifles, engraved antiqued in brass, Silver or Gray, or black finished. They All come with fine Quality wood stocks and fore grips. 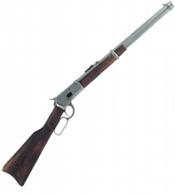 We have Mares Leg Lever actions and looped lever like Chuck Connors the Rifleman used. You know who else used it in such a commanding manner helping him get his old job back, in two different movies. Break open a keg, pop a cork and sit a while. Whether you are adding to your collection, reenacting, filming or gearing up for stage productions you are going to love these. 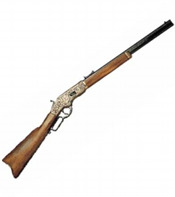 M1873 Brass With Engraving Rifle: This classic Old West rifle features working lever action, engraved brass receiver and heavy octagonal barrel. A classic display piece for your office or home. Length: 39.5 Weight: 7 lbs.